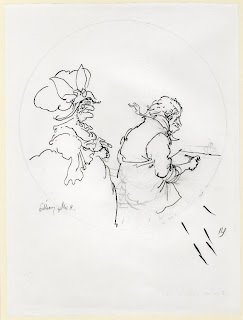 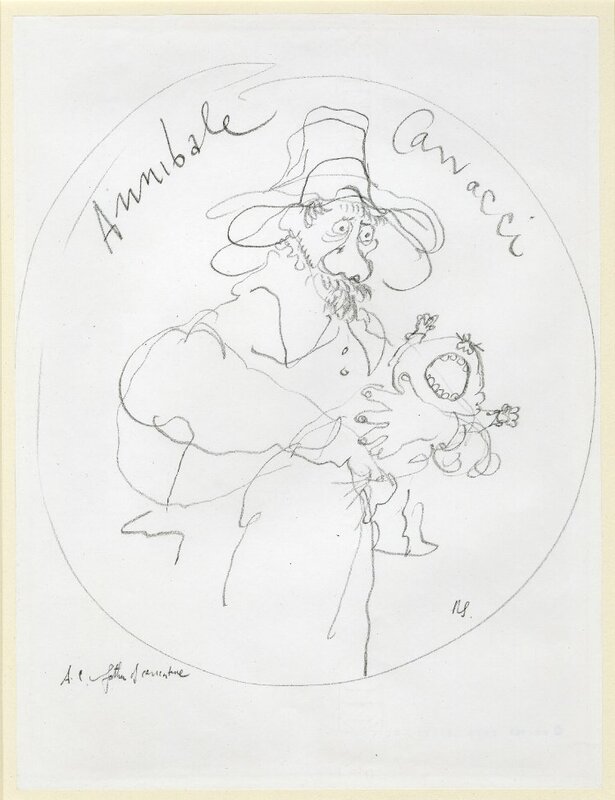 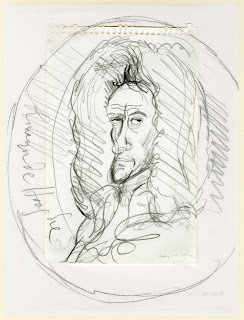 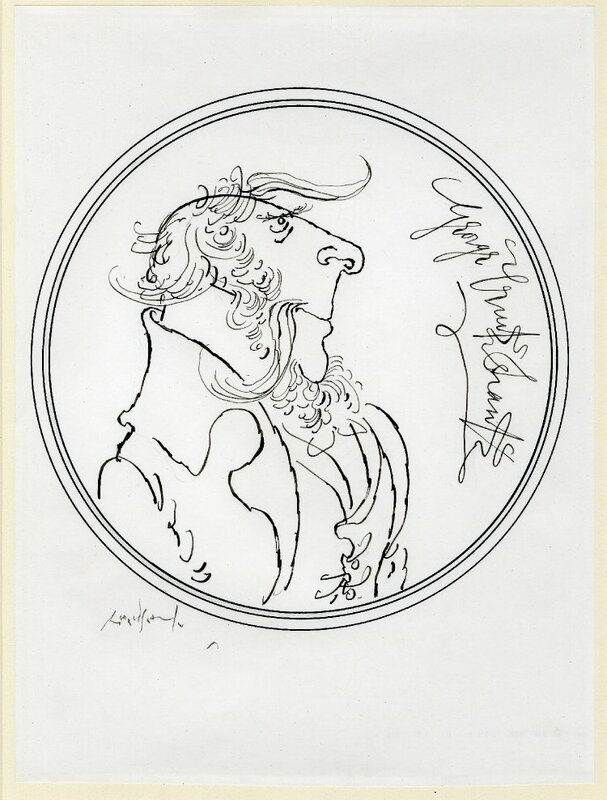 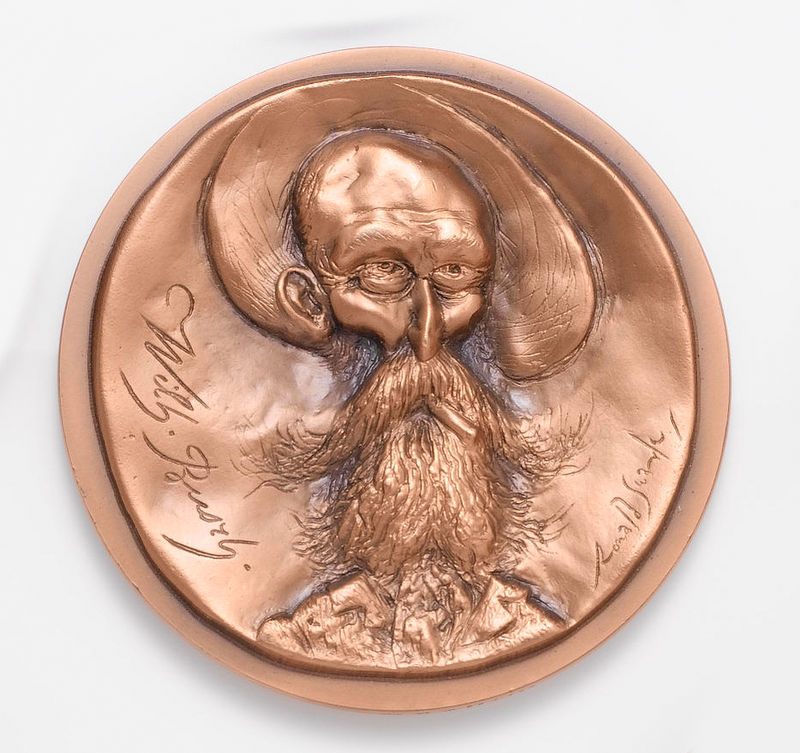 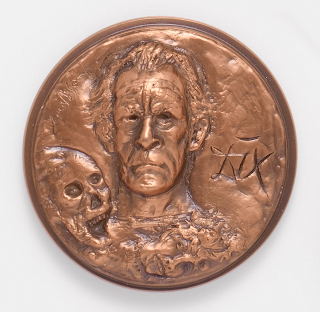 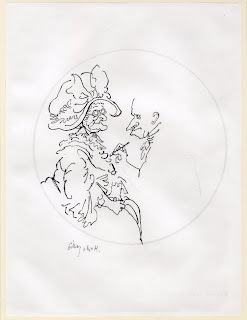 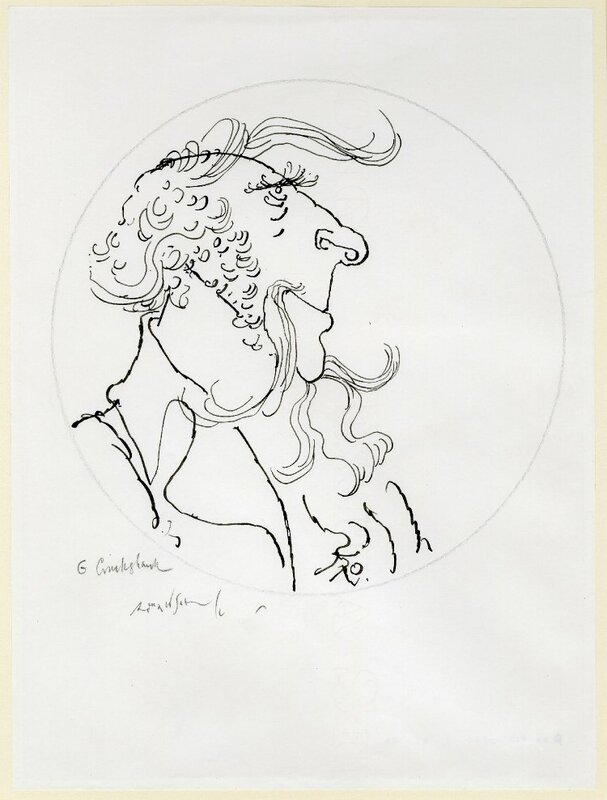 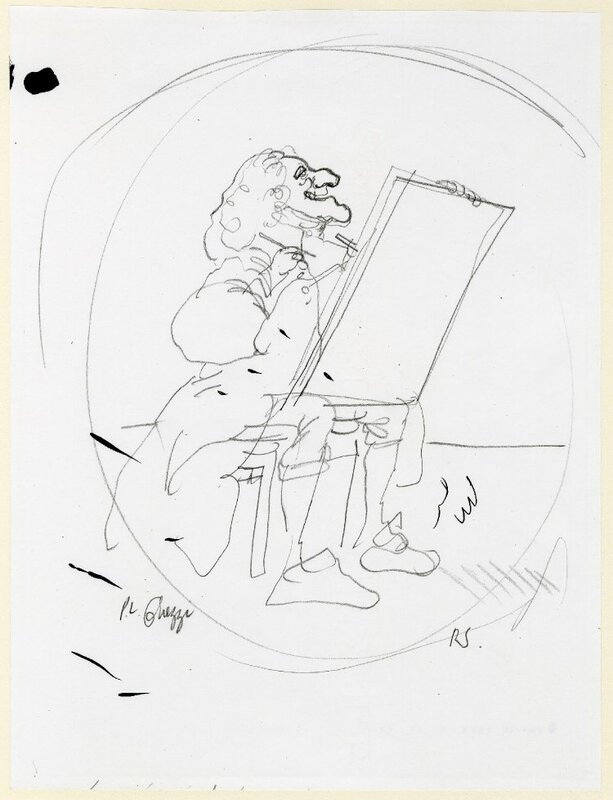 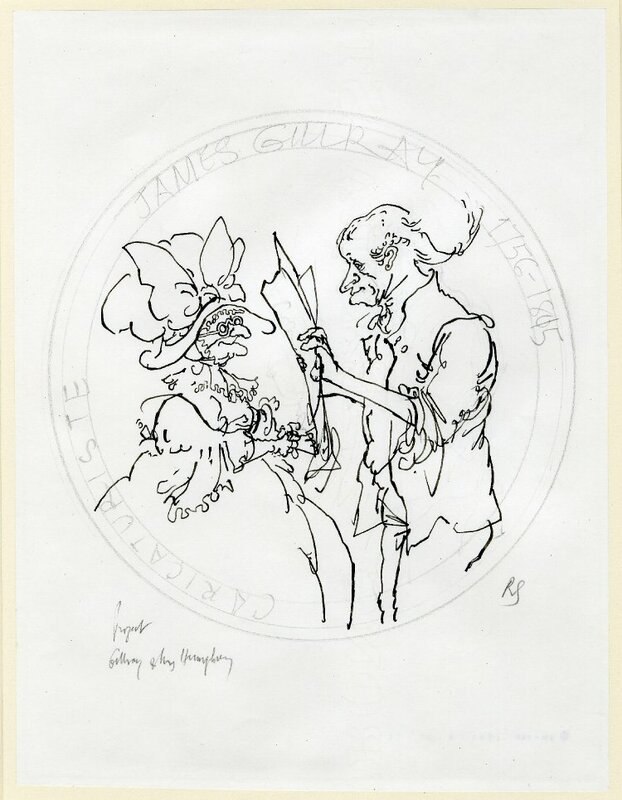 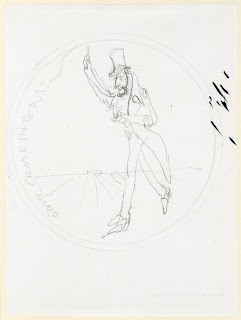 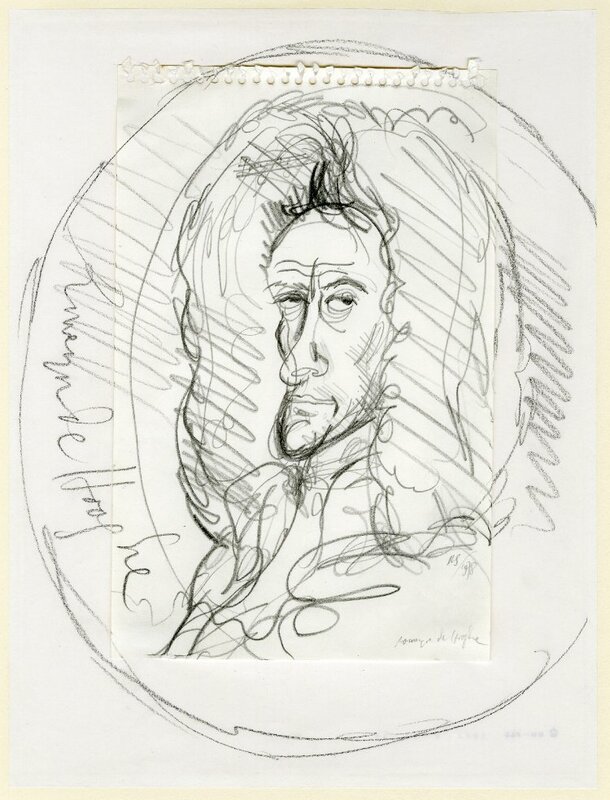 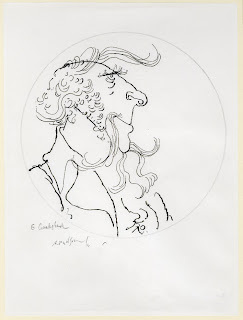 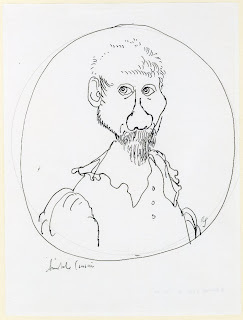 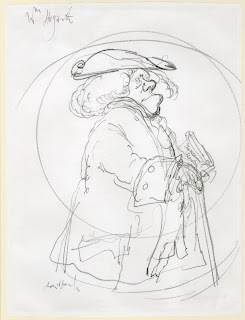 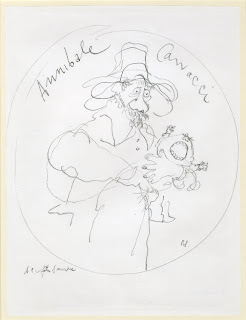 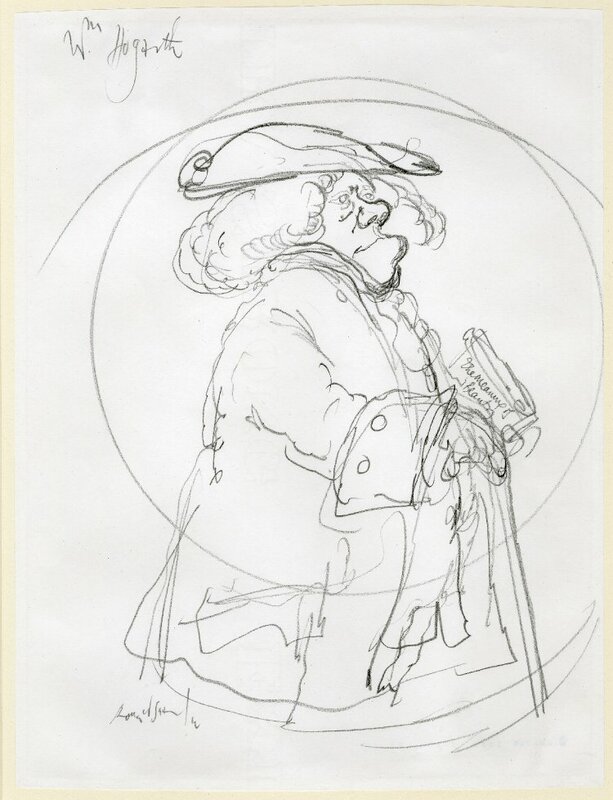 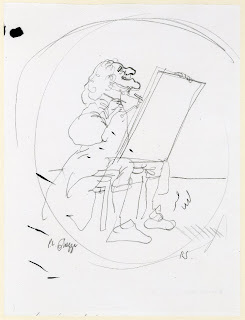 Searle made this study of George Cruikshank (1792-1878) for Six Fathers of Caricature, a series of medals struck by the French Mint from 1976-77. 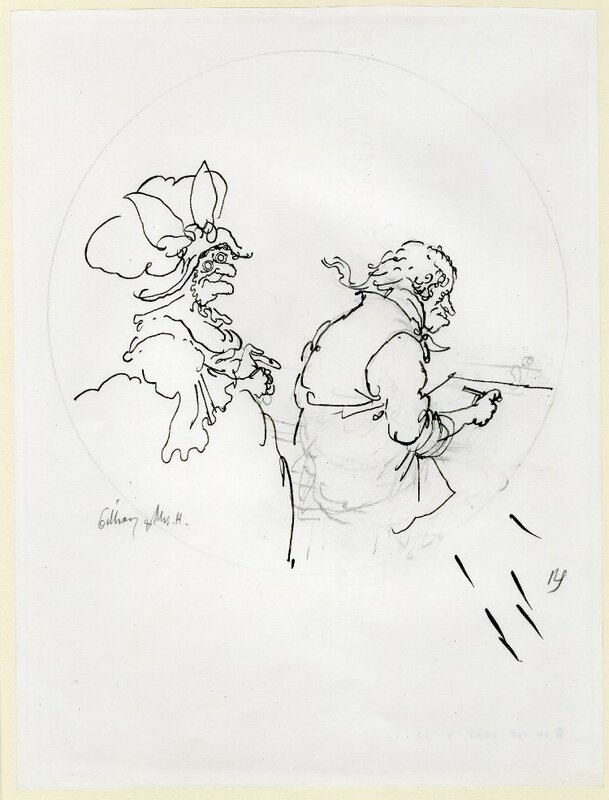 The other artists commemorated are Carracci, Ghezzi, Hogarth, Gillray, and Rowlandson. 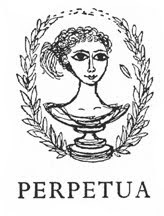 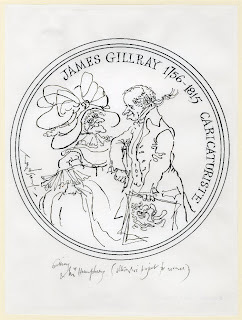 All the related drawings are in the Department of Prints and Drawings , while the medals themselves were presented by the artist to the Department of Coins and Medals of The British Museum. 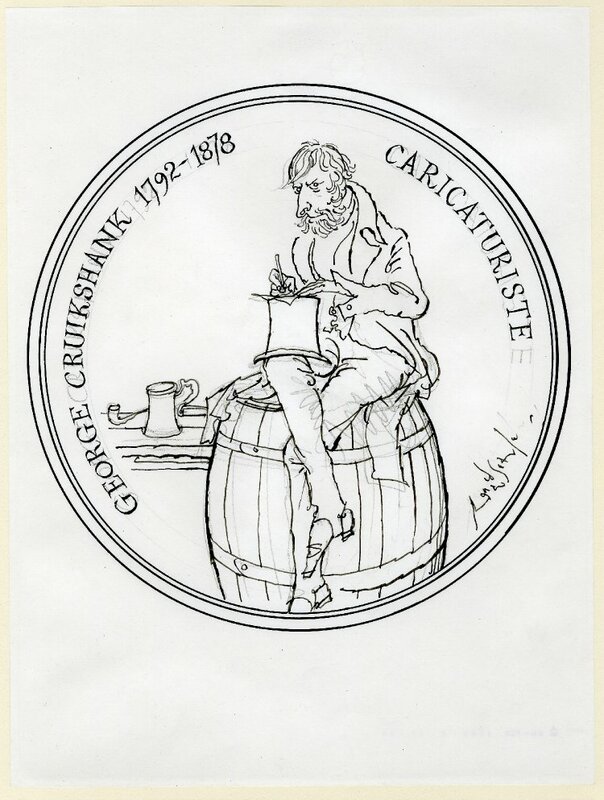 Cruikshank was a celebrated caricaturist in nineteenth-century England; succeeding Gillray as the country's leading political cartoonist. 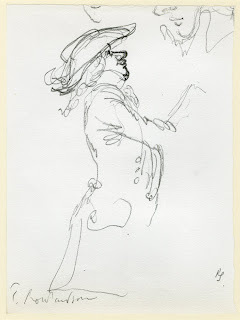 Today, however, he is best known for his illustrations to Charles Dickens's novels. 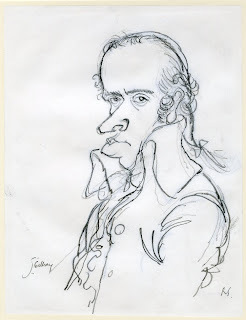 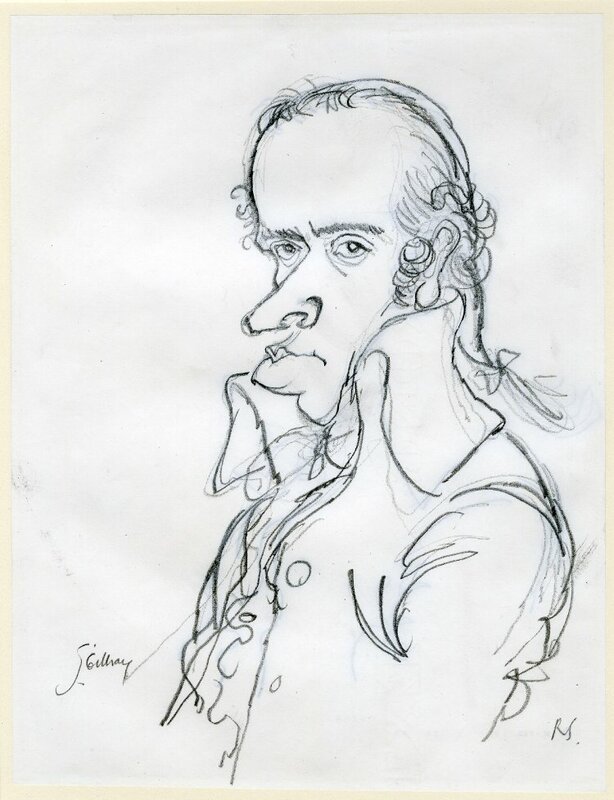 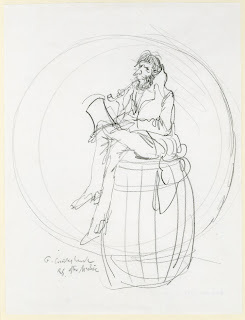 The source of this sketch is a portrait by Daniel Maclise, the most frequently reproduced portrait of Cruikshank, published in Fraser's Magazine in 1833. 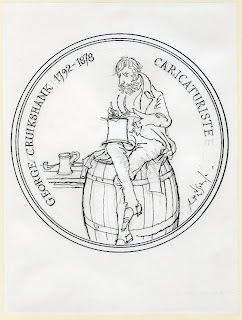 Cruikshank disliked the portrait; he became a vigorous teetotaller and objected to Maclise's depiction of him sketching in a tavern, seated on a beer barrel with a tankard and pipe beside him. Searle's final design shows Cruikshank sitting outside on the barrel amidst a riot, the tankard removed. 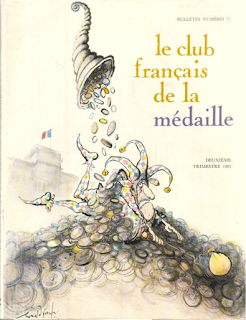 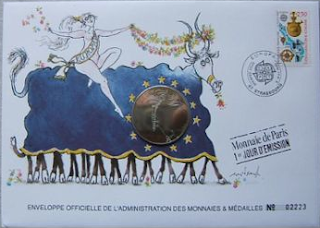 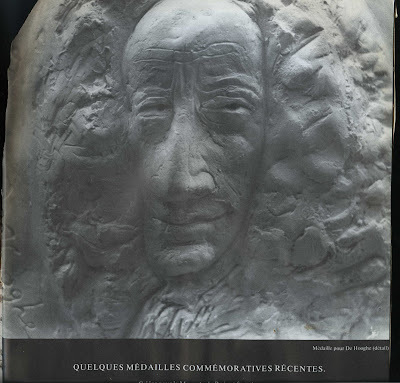 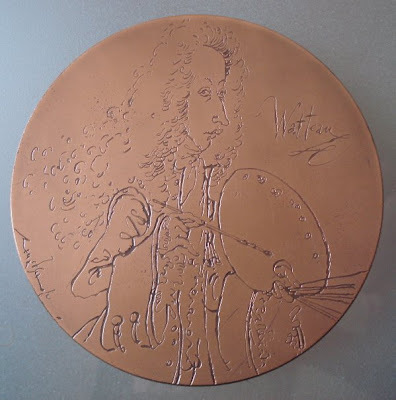 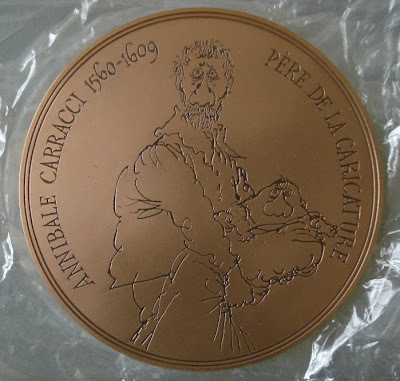 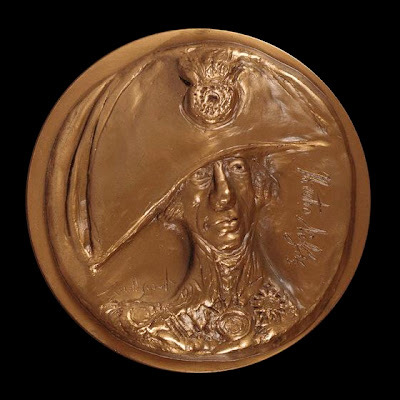 Searle made his first medals for the Paris Mint in the early 1970s. 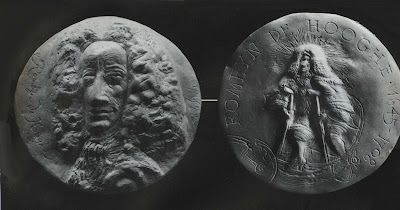 He has since executed several medals for BAMS, of which this was the first. 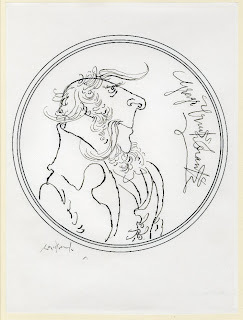 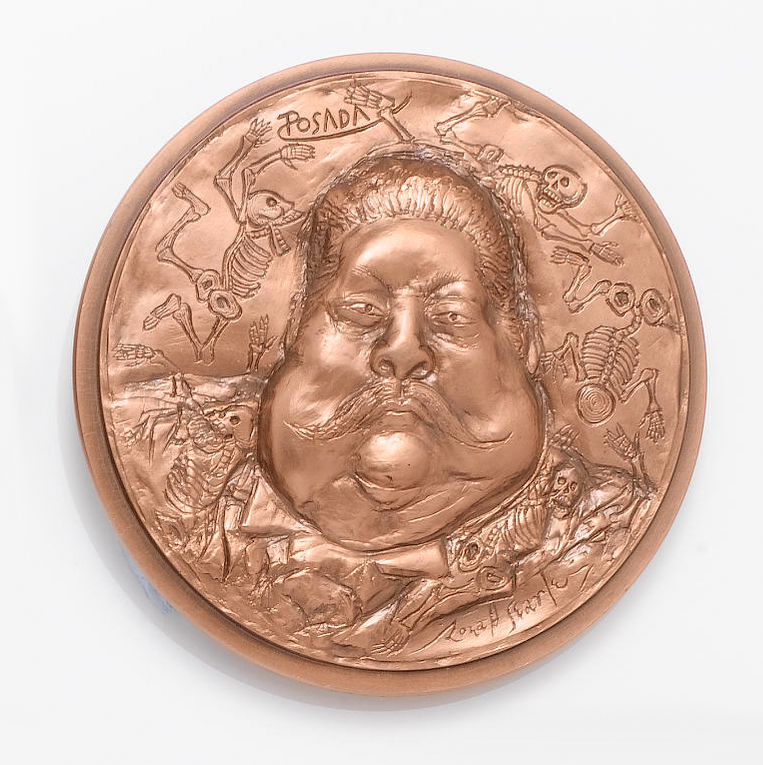 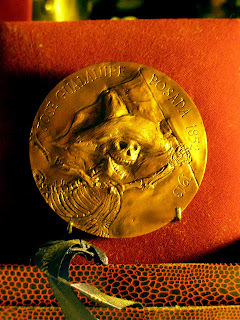 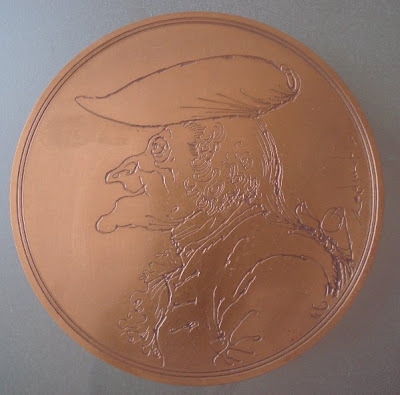 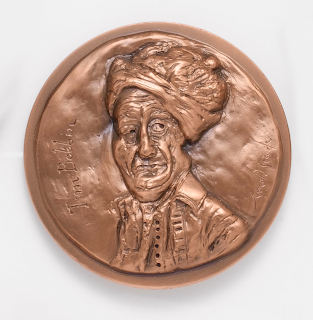 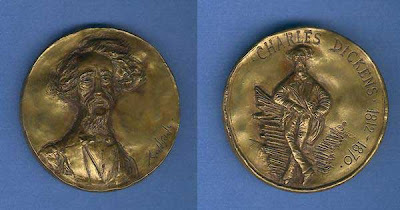 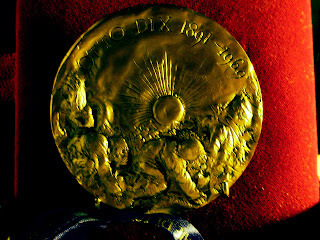 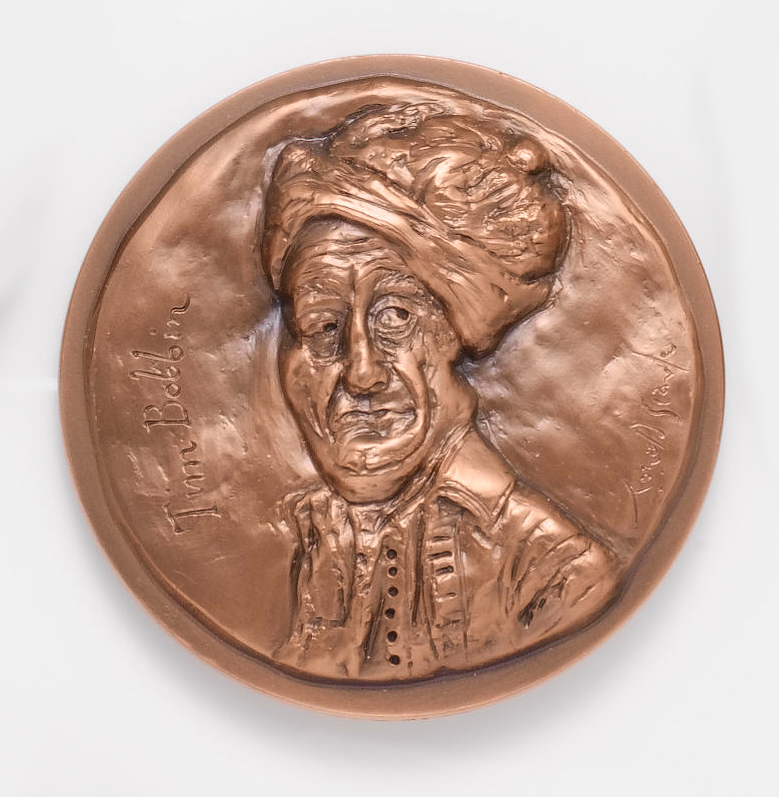 Searle's medal of James Boswell continues a literary theme that began with his medal of Edward Lear, modelled in 1975 and issued by the Monnaie de Paris, and has been apparent in two of the artist's BAMS medals: those of Charles Dickens and Samuel Pepys medals, which appeared in 1983 and 1984 respectively. 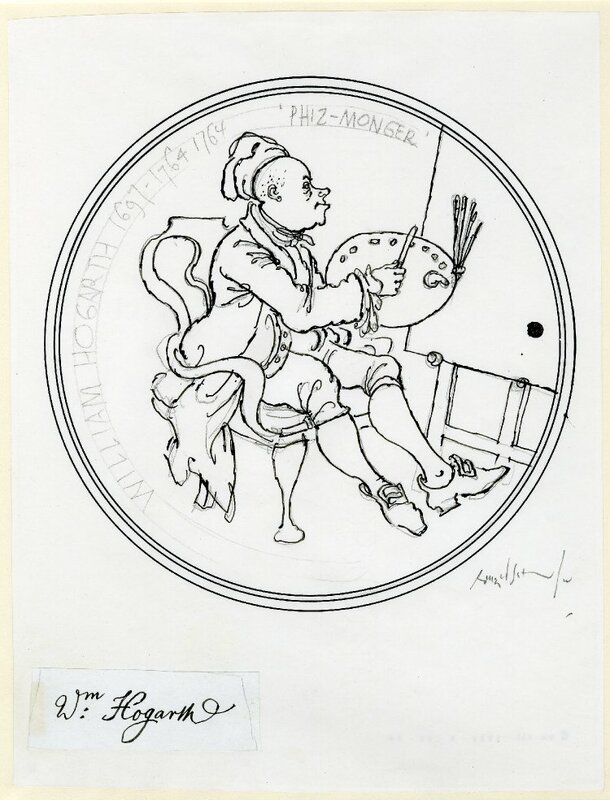 On this witty new medal Boswell, the biographer of the great lexicographer Samuel Johnson, is portrayed on one side, pen in hand, whilst on the other he chases after the great man, notebook in hand so as to catch the doctor's bons mots. 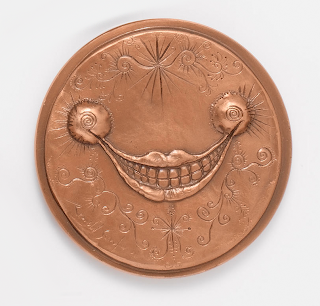 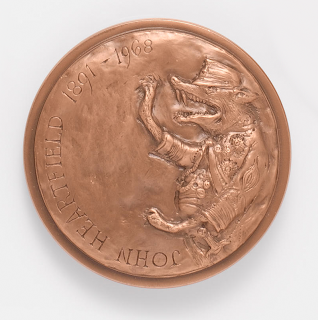 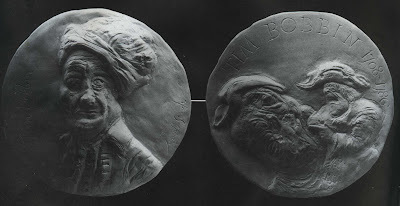 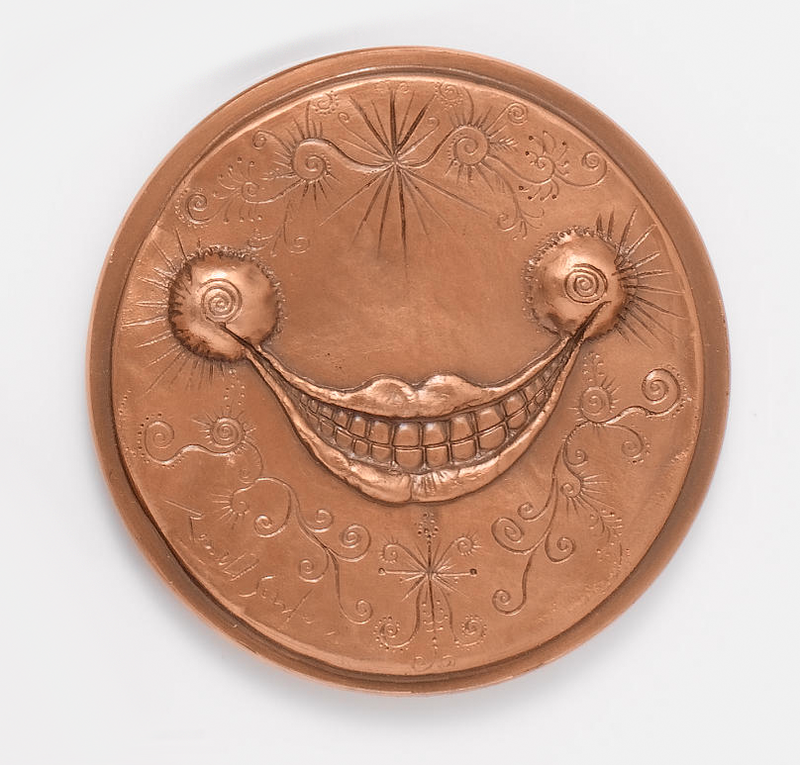 Like the earlier Dickens medal, the Boswell medal is being issued in two versions, both as a struck two-sided piece and as two large electroformed uniface works. 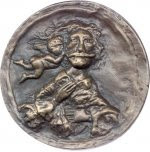 The latter have been taken directly from the models produced by the artist in 1999, and their issue by the Society has been made possible by generous sponsorship from David Silich. 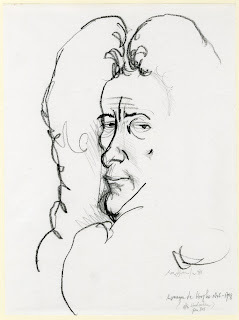 Samuel Pepys Esqr. 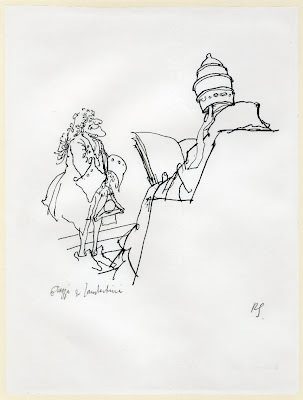 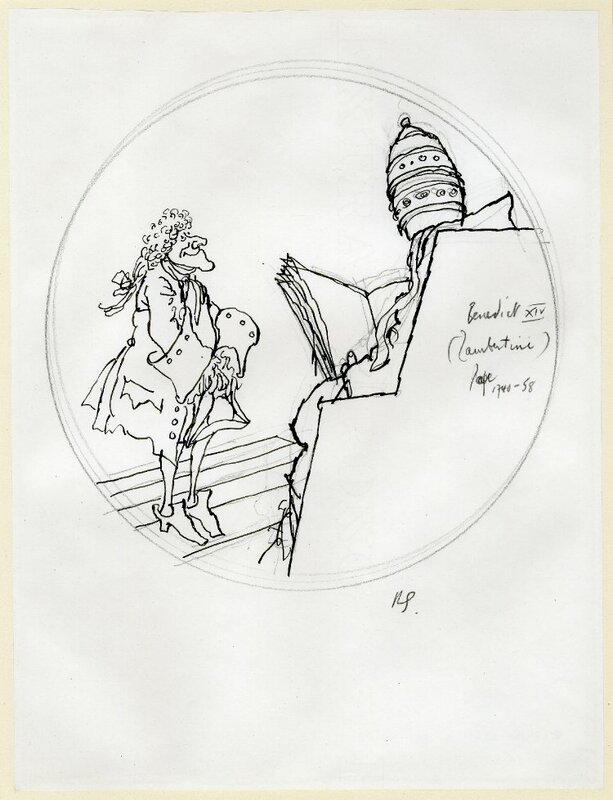 Searle's witty view of the celebrated diarist. 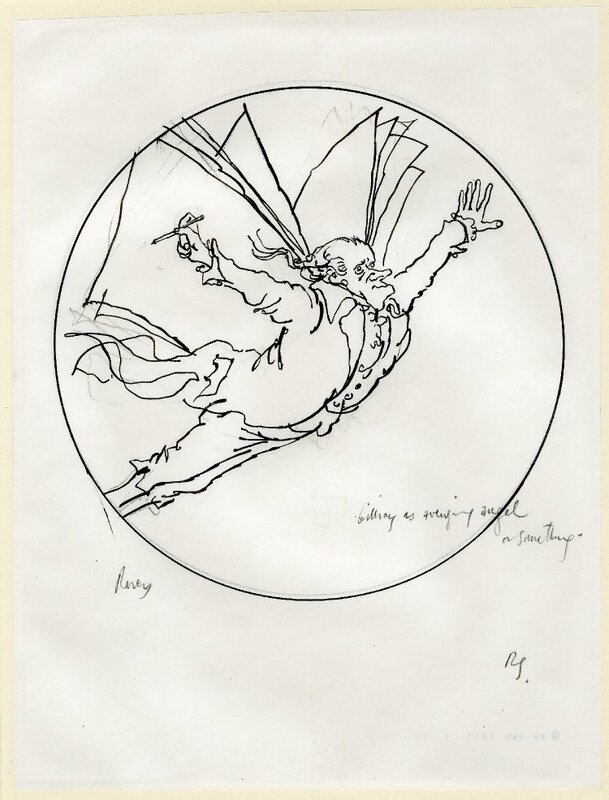 Bernini Getting the Message from the Angel of the Baroque. 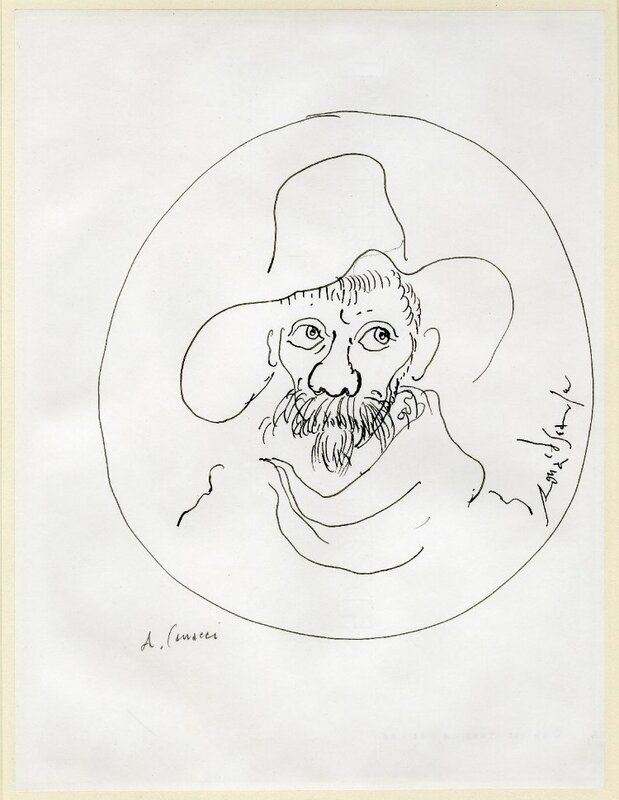 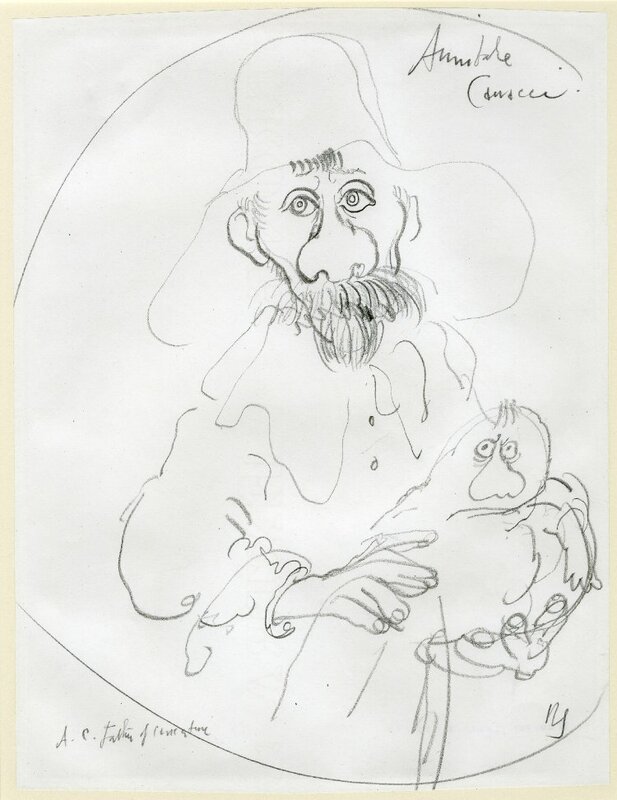 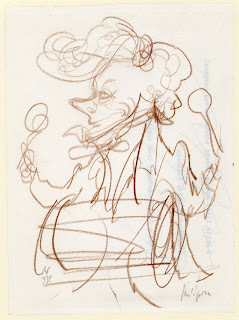 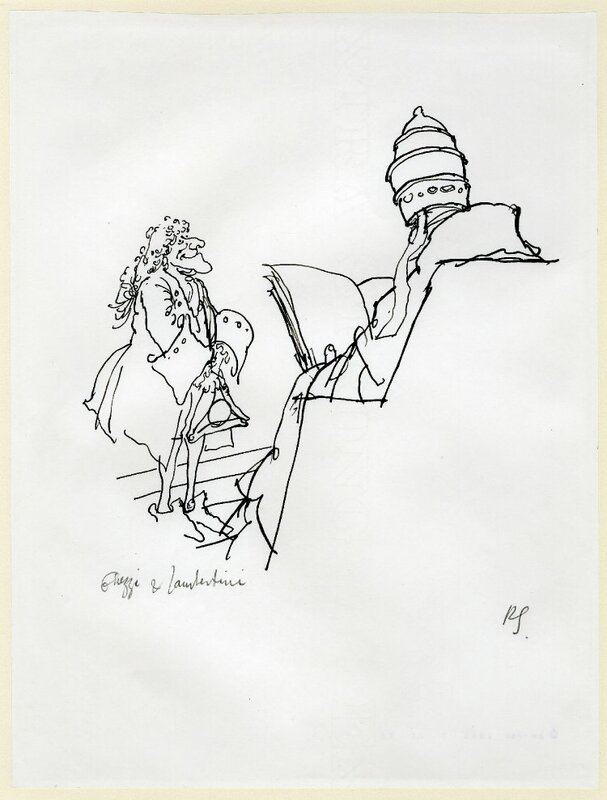 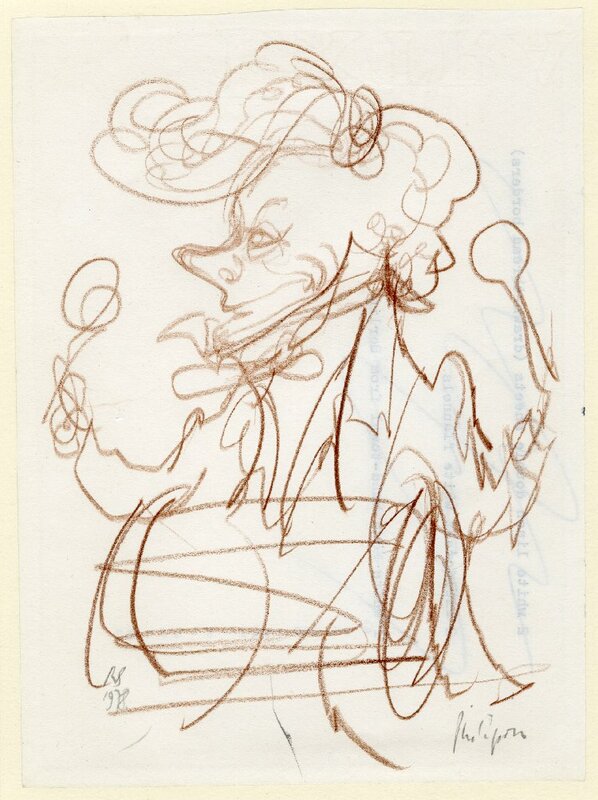 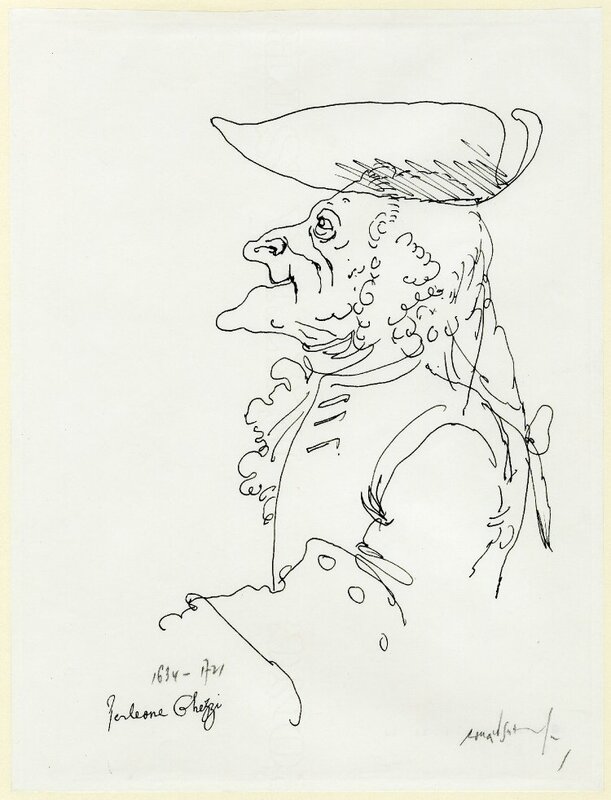 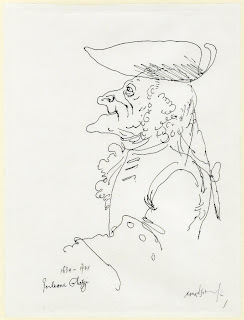 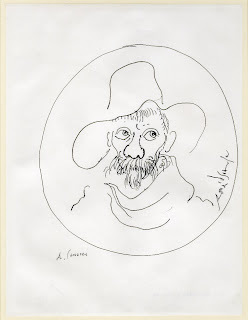 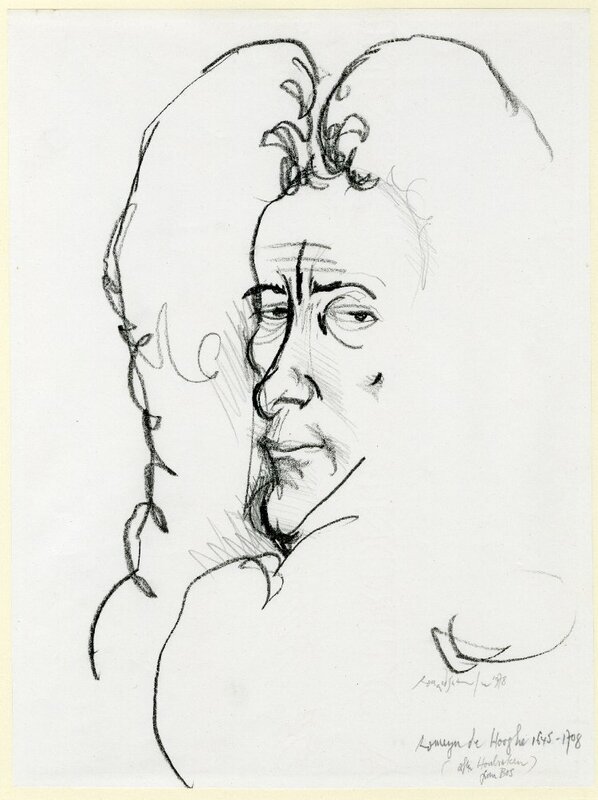 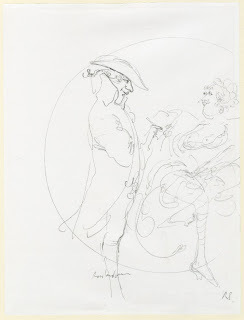 Searle's vision of the inspiration of the great Italian sculptor. 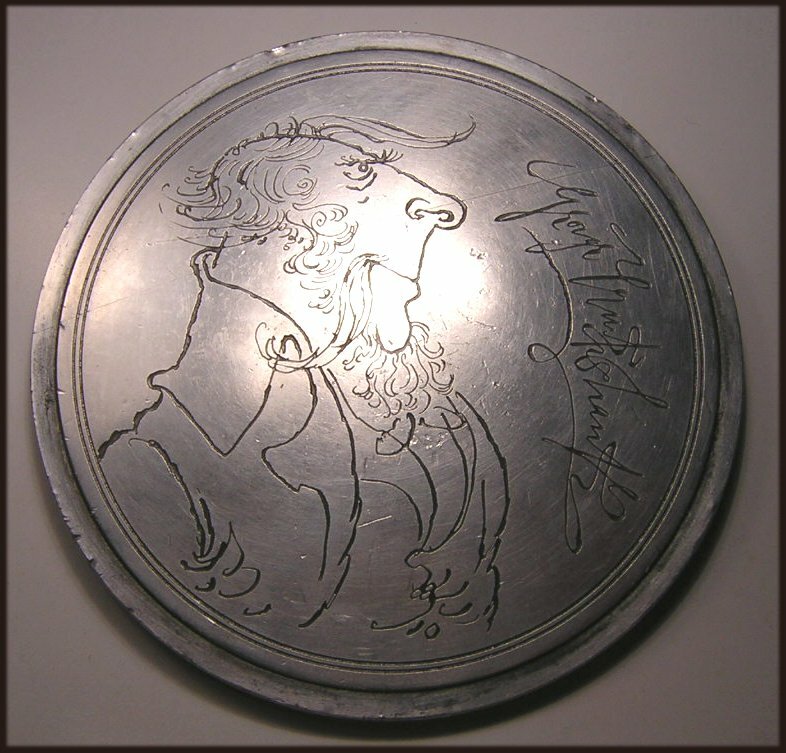 This medal marked a new departure as the first of Searle's works to be conceived as a cast rather than as a struck medal. 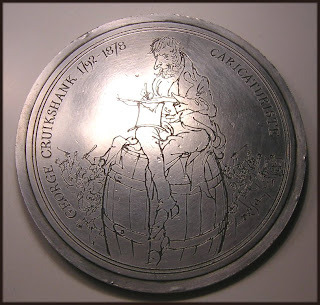 The Taltarni Vineyards instigated an award for services to Australian wine industry and commissioned the artist Ronald Searle to design the prize medal. 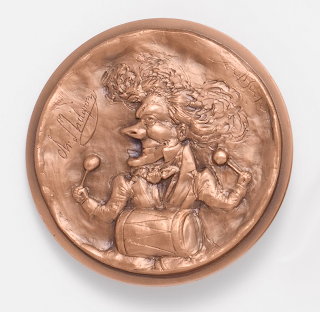 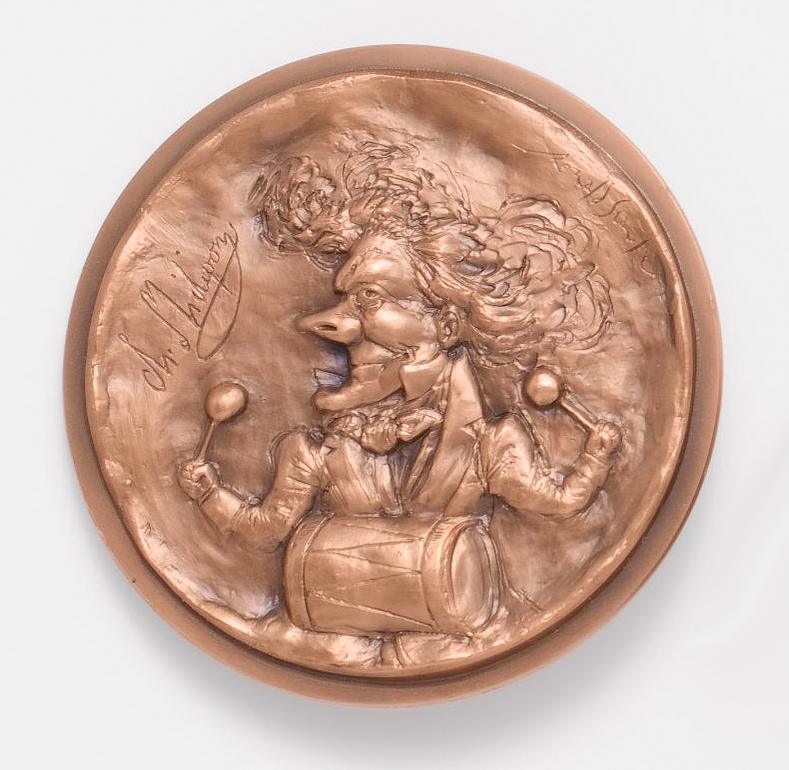 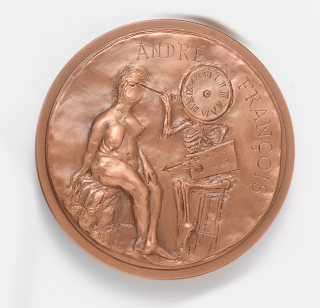 This example of the medal was presented to the Museum both of a medal related to the wine industry and as an example of late twentieth century medallic art. 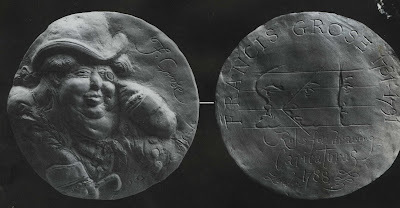 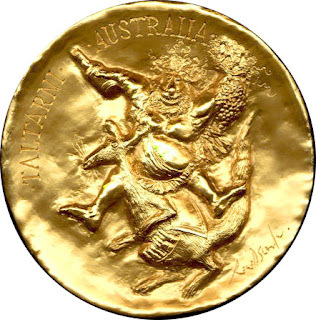 Obverse – A cartoon-like representation of Bacchus, the god of wind, riding a Kangaroo with the legend TALTARNI AUSTRALIA and the signature of the artist. 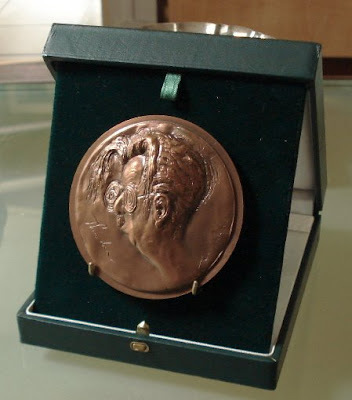 Romeyn de Hooghe, study for a medal, formerly in an album; male head, turned slightly to left and looking to front. 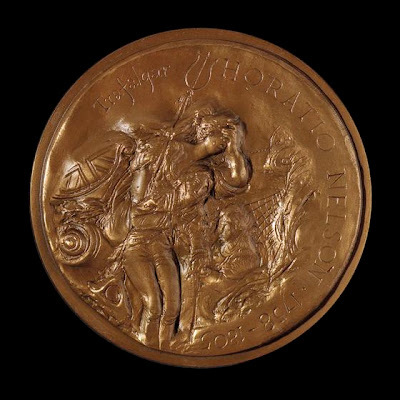 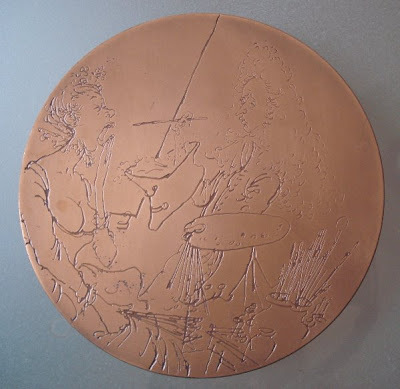 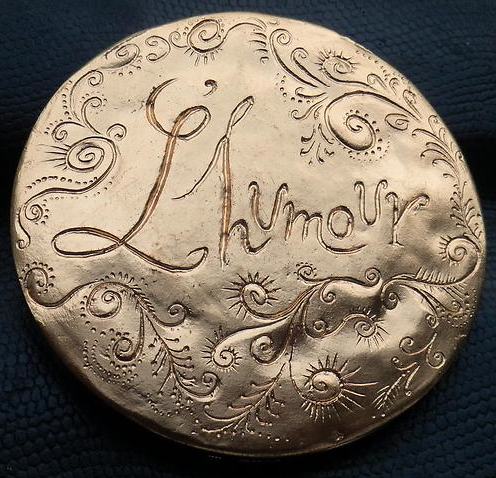 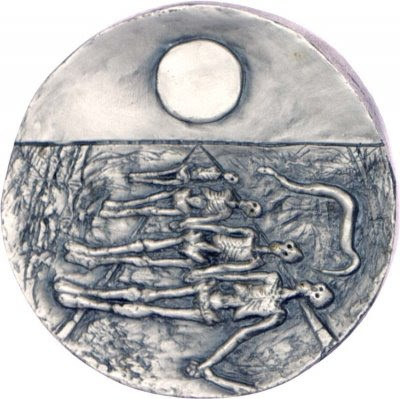 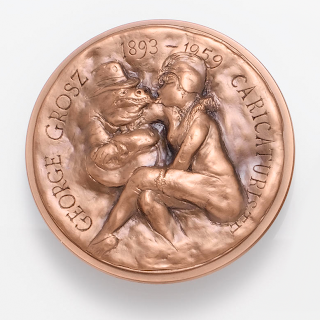 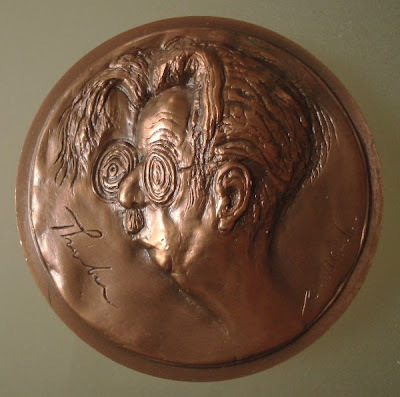 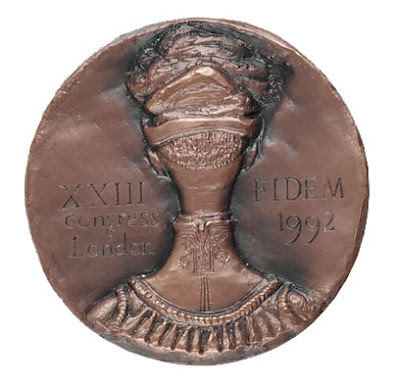 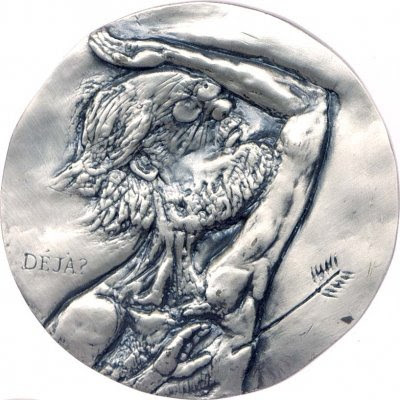 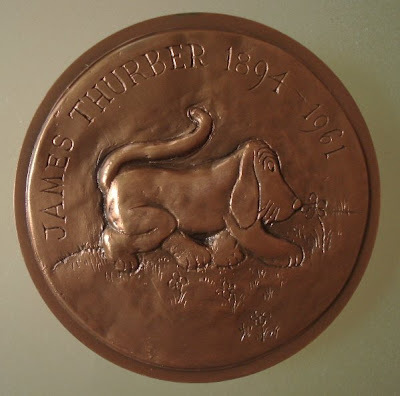 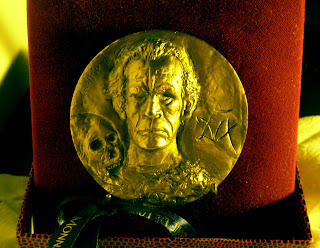 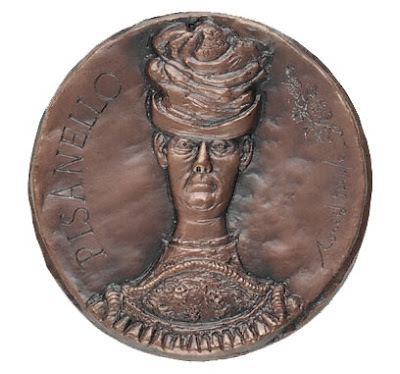 The artist described this medal as a 'Medal in Commemoration of a Mini-drama. No. 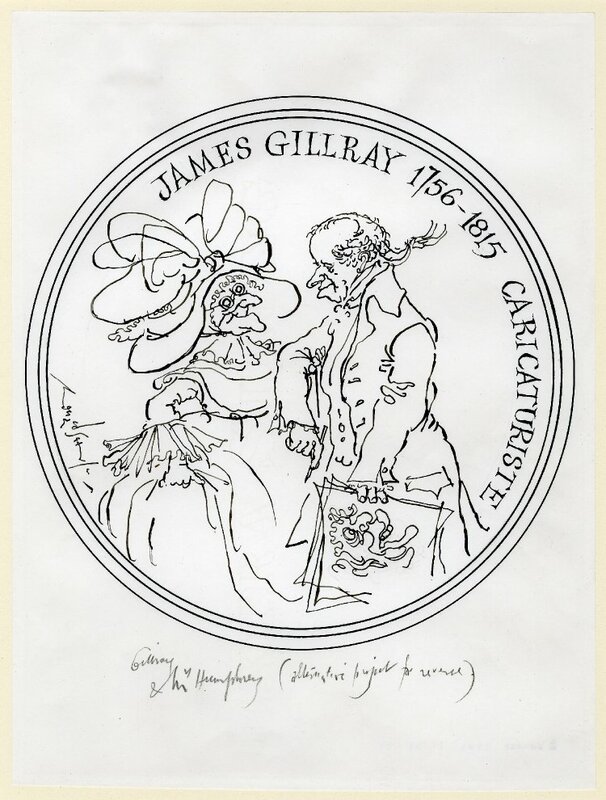 1 in a series of Great Classical trivialities', and added 'I feel that it is rather appropriate that there can be an occasion when a satirist can deflate himself publicly and take a little of what he likes to deal out to others!' 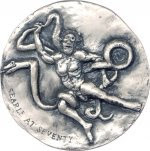 The snake around Laocošn forms the figures '7' and '0'. 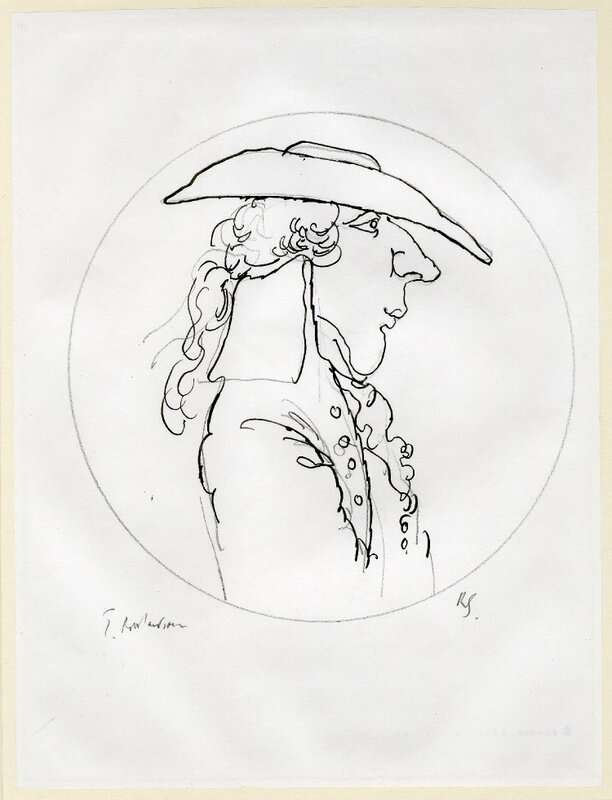 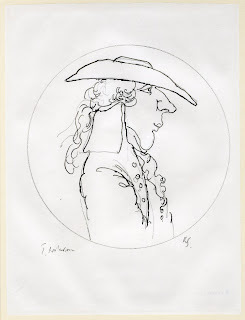 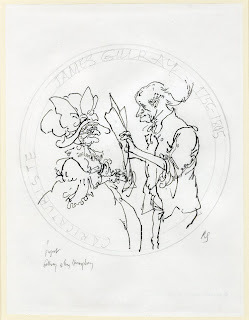 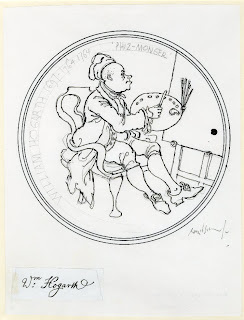 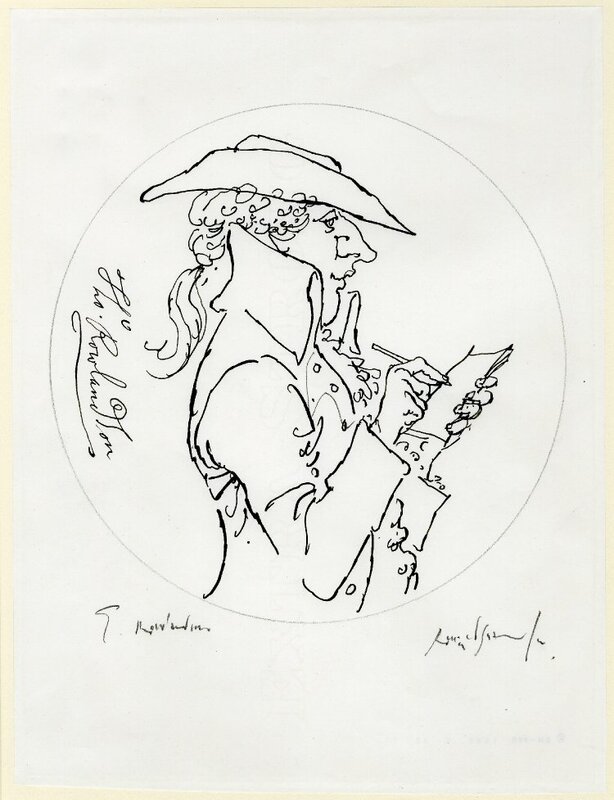 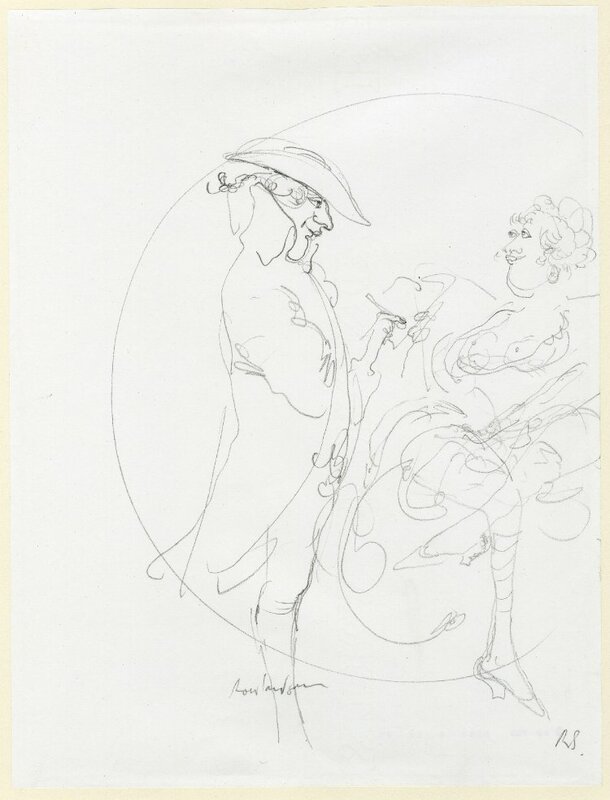 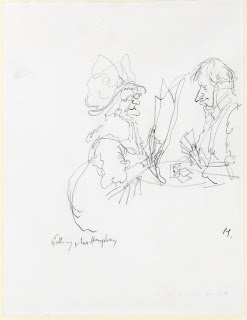 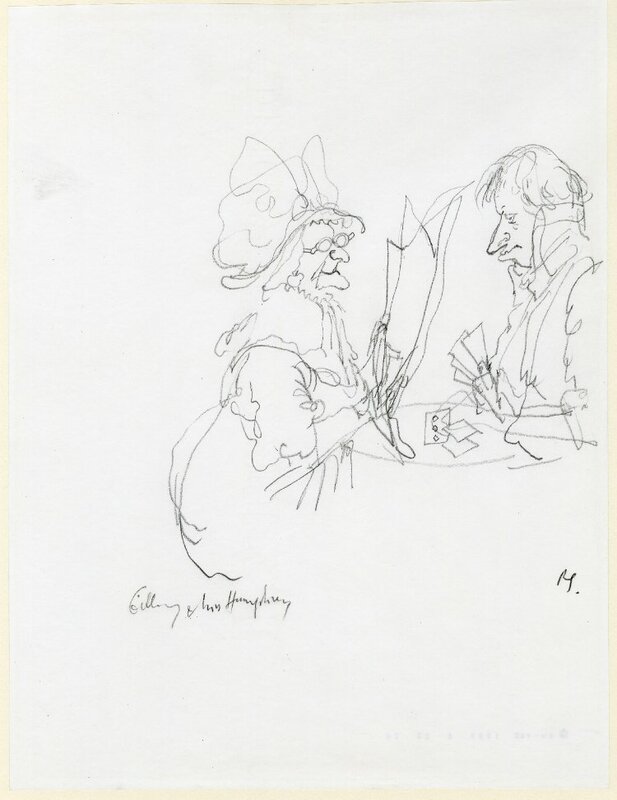 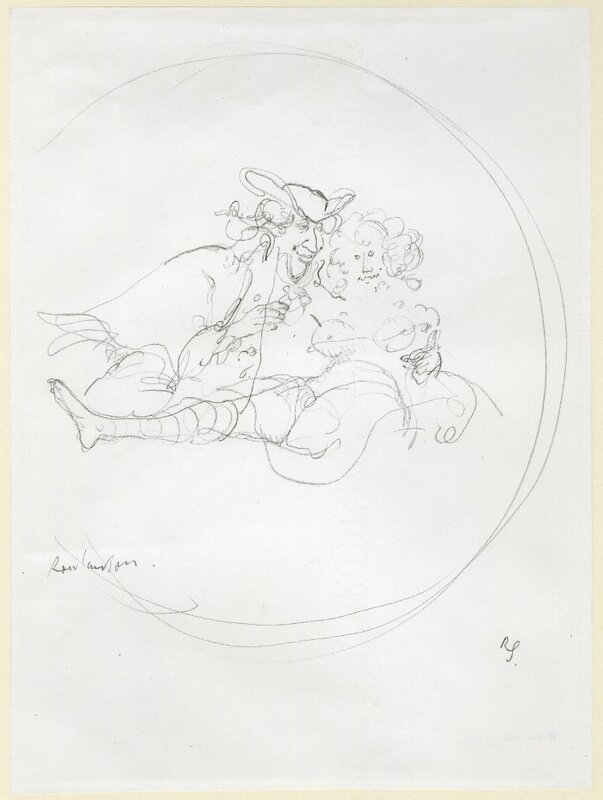 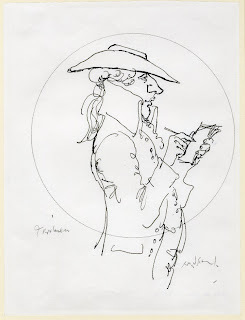 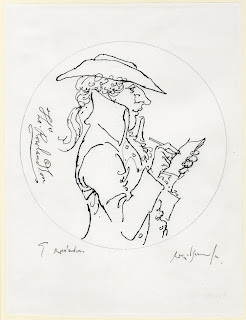 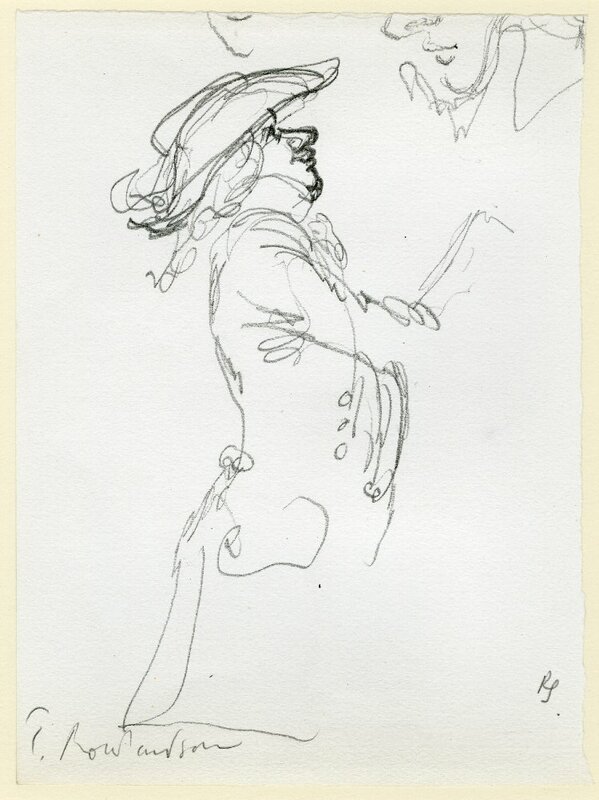 William Hogarth, study for medal, formerly in an album; almost three-quarter length male figure, turned to right, and holding "The Meaning of/Beauty"
Jose Guadaloupe Posada, Ronald Searle, La monnaie de Paris. 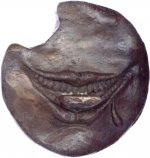 This is one of my favorite sites on the web. 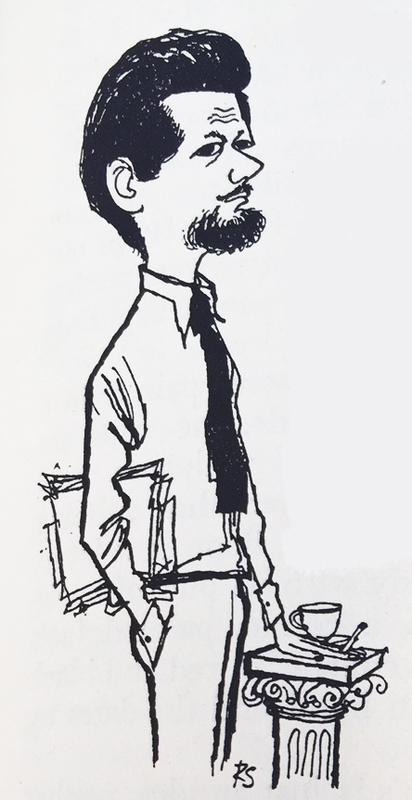 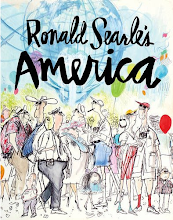 Thanks for yr hard work.Ronald Searle ,Quelle Genius. Glad you like what I'm posting here-it's interesting to see Searle working in three dimensions. These coins are the nearest Searle has come to sculpture I believe. 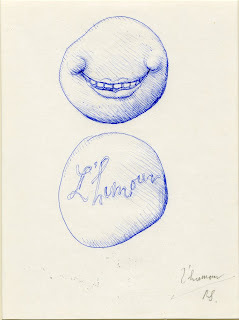 Except for the models he made for the Chelsea Arts Ball in the Fifties. 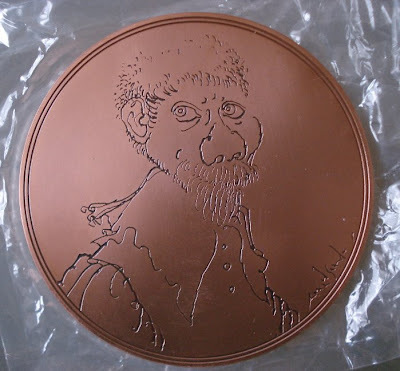 More on that in a future post. 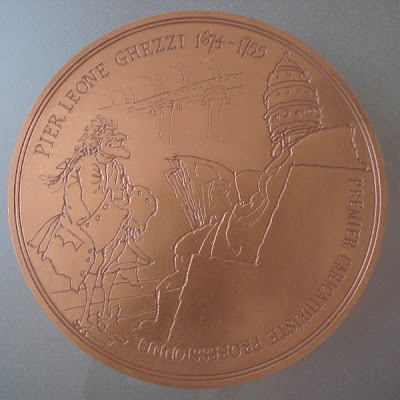 My father in law found a 1976 La Gloire medal in bronze. 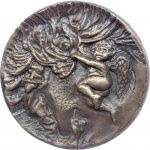 I have seen numerous articles on this medal as silver, but not bronze. 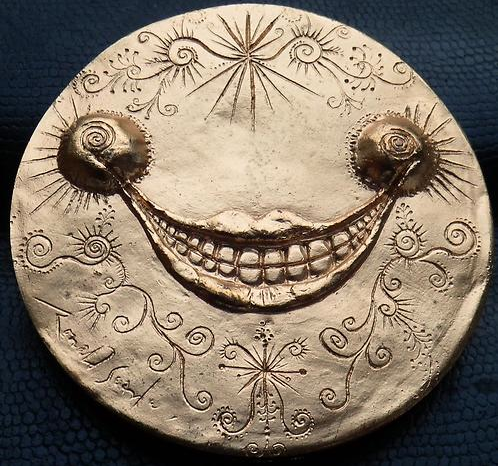 Any idea who to contact regarding what this is?